Australian Dewatering Systems Pty Ltd (ADS) are the leading dewatering specialists. We provide efficient, thorough and environmentally-friendly site dewatering that meets and often exceeds the EPA guidelines relevant to the Local, State and Federal governments. 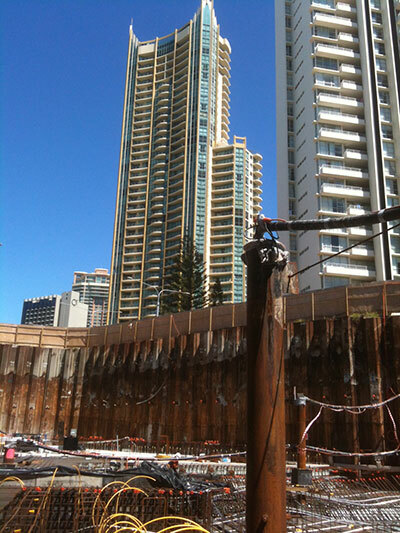 Our Deep Well Dewatering system is especially suited to high-rise structures that are expected to be under construction for up to 12 months or more. We also provide deep well systems in a range of civil applications and various other deep excavations throughout Australia. Our experienced team works with the site construction team to strategically position wells around the site. The ADS deep well system economically and reliably lowers the water table with little disruption to the excavation and construction process. Deep well dewatering differs from wellpoint (also known as spearpoint) systems in that each deep well contains a submersible pump which pushes the water up the well via a discharge pipe to the point of treatment and/or discharge. In contrast the wellpoint system relies on a vacuum that draws the water from above the excavation through a series of small diameter spears via a ‘header’ discharge pipe. Deep wells are often installed in a grid within the site boundaries to act in combination to achieve a dry working platform. A deep well is installed using an outer and inner caisson. The void between the outer and inner caisson is packed with gravel to act as a filter medium. The inner caisson is slotted to allow for ingress of water. Submersible pumps are lowered into the inner caisson to allow for high head pumping. The pumps are engineered to withstand the aggressive corrosion factors associated with use over sustained periods of time in a saline environment. The ADS groundwater filtration system is generally used in conjunction with the dewatering system to deliver the best quality discharge of water into the receiving environment. A Dewatering Management Plan (DMP) is mandatory prior to commencement of dewatering to co-ordinate the correct method of discharge and the approved water quality guidelines for each individual site. ADS can manage the DMP on behalf of the client. ADS work closely with environmental consultants on a daily basis to ensure the client’s environmental requirements are met and the DMP guidelines are stringently followed whilst delivering the most efficient and economical dewatering solution. Reduced Noise: ADS are aware of sensitivity to noise in residential areas. Our deep well systems are designed to work quietly and efficiently. Next To Zero Maintenance: The system requires little or no maintenance as the pump sets are robust and reliable. If maintenance is required ADS has fully experienced service technicians on call 24 hours a day, 7 days a week. Environmentally Sound: In most applications, the water is removed from the site and treated prior to discharge. If necessary, ADS monitors and treats the groundwater through our state-of-the art, computerised filtration system. This system provides real time telemetry to ensure that water meets relevant statutory requirements. Site dewatering is commonly required when excavations are required to be deeper than the natural water table. Deep well dewatering is recognised as a cost effective and efficient way for medium to long term dewatering of larger projects where the excavation is greater than 4m or when a wellpoint system is deemed inefficient. The main objective in any dewatering exercise is to lower the water table below the working platform and maintain the reduced level economically and efficiently for the duration of the dewatering period. The soil profile and its permeability in and around the site will determine which type of dewatering system will be most effective. This in turn will allow ADS to formulate the number and size of wells required to lower the water table for excavation. Positioning may also be considered to suit the client’s construction requirements. Groundwater management involves strategic positioning of wells to provide a dry working platform and to limit the effects on the groundwater table (GWT) beyond the site. The basic drawdown effect is illustrated in figures 1 to 3. The reduced water table forms a cone of depression between the natural GWT and the submersible pump. The extent of local reduction in the water table is dependent on the pump depth, capacity and the permeability of the soil. The depressed water table at distance (H) (as shown in figure 3) from the natural GWT depicts the dewatering of a typical high-rise site. ADS provides technical assistance for selection of the most efficient method for your particular job or site. We will manage the system, leaving you to carry on with the rest of your building and construction requirements. The company also has Australia’s largest fleet of water treatment settlement tanks as part of a groundwater treatment system suitable to all ground conditions, including acid sulphate, organic and clay, and is fully computerised to manage coagulation, flocculation and PH adjustment. The groundwater treatment system includes a 24 hour, 7 day a week remote alarm via SMS and email direct to our service technicians. This technology is used in conjunction with the recommendations of the client’s site specific dewatering management plan (DMP), to provide the best work practice. Note: Drawings are examples only for the purpose of illustration. Since environmental regulations also demand that water discharged from the site meets high water quality requirements, developers require a dewatering management plan (DMP) for the discharge. This can be provided by Australian Dewatering Systems.